World War I – known at the time as “The Great War” – officially ended when the Treaty of Versailles was signed on June 28, 1919, in the Palace of Versailles outside the town of Versailles, France. However, fighting ceased seven months earlier when an armistice, or temporary cessation of hostilities, between the Allied nations and Germany went into effect on the eleventh hour of the eleventh day of the eleventh month. With the approval of this legislation (Public Law 380) on June 1, 1954, November 11th became a day to honor American veterans of all wars. 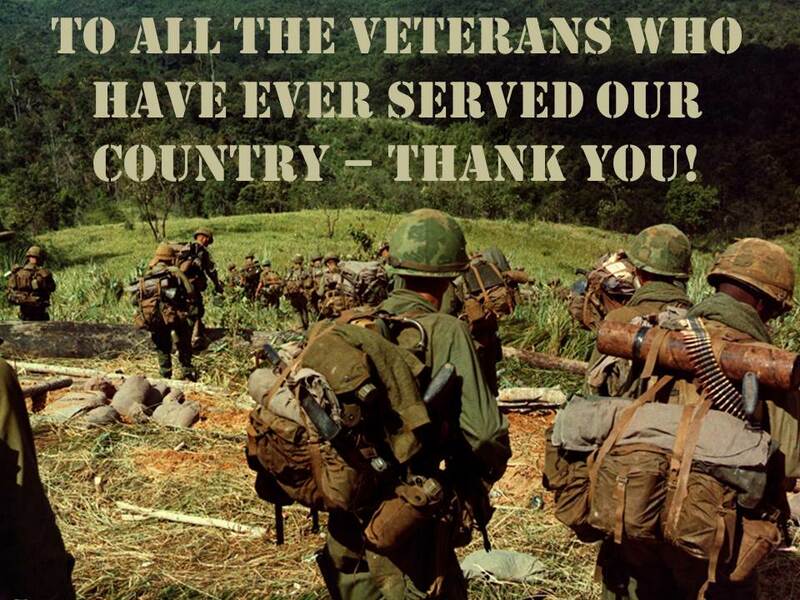 The first Veterans Day under the new law was observed with much confusion on October 25, 1971. It was quite apparent that the commemoration of this day was a matter of historic and patriotic significance to a great number of our citizens, and so on September 20th, 1975, President Gerald R. Ford signed Public Law 94-97 (89 Stat. 479), which returned the annual observance of Veterans Day to its original date of November 11, beginning in 1978. This action supported the desires of the overwhelming majority of state legislatures, all major veterans service organizations and the American people. Today, Veterans Day, is a celebration to honor America’s veterans for their patriotism, love of country, and willingness to serve and sacrifice for the common good. To all who served, Thank You. 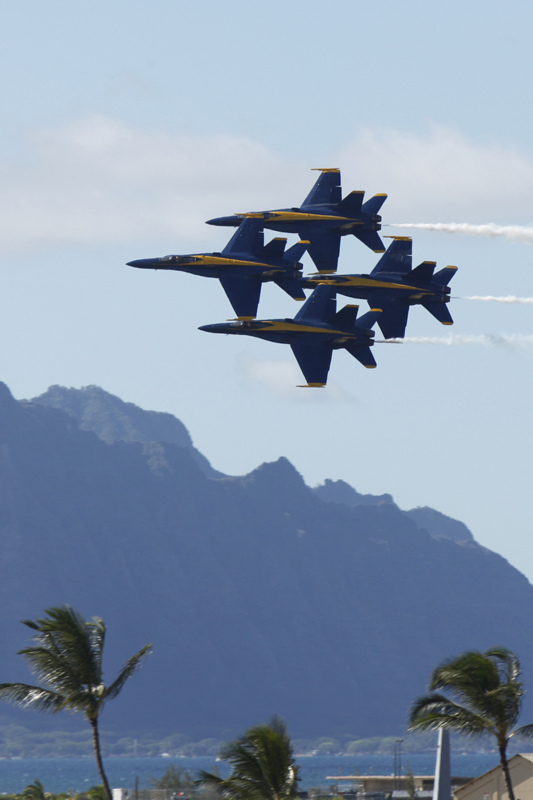 The Kāneʻohe Bay Airshow at Marine Corps Base Hawaiʻi will take place on September 29-30, 2012 and is free to the public. At the end of World War II, the Chief of Naval Operations, Chester W. Nimitz, ordered the formation of a flight demonstration team to keep the public interested in naval Aviation. The Blue Angels performed their first flight demonstration less than a year later in June 1946 at their home base, Naval Air Station (NAS) Jacksonville, Florida. By the end of the 1940s, the Blue Angels were flying their jet aircraft, the Grumman F9F-2 Panther. In response to the demands placed on Naval Aviation in the Korean Conflict, the team reported to the aircraft carrier USS Princeton as the nucleus of Fighter Squadron 191 (VF-191), “Satan’s Kittens,” in 1950. Today the Blue Angels fly the Boeing F/A-18 Hornet. Transporting Blue Angels maintenance and support personnel, communication equipment and spare parts is a United States Marine Corps C-130T Hercules nicknamed, “Fat Albert Airlines.” In past Kaneohe Bay Airshows, Fat Albert has demonstrated its jet-assisted takeoff (JATO) capability which enables the plane to takeoff from as little as 1,500 feet of runway, climb at a steep 45-degree angle, and attain an altitude of 1,000 feet within 15 seconds. “Malibu” Chuck Aaron is the first and only civilian pilot ever to be licensed to perform helicopter aerobatics in the United States. In fact, he’s one of only a handful of pilots permitted to execute the dangerous maneuvers internationally. Chuck is also the first helicopter pilot to be presented with the Art Scholl Showmanship Award, an honor bestowed by the International Council of Air Shows to recognize the world’s most outstanding air show performers, and was inducted in 2011 to the prestigious Society of Experimental Test Pilots. Kirby Chambliss is noted as one of the best aerobatic pilots in the world. A five-time winner of the U.S. National Aerobatic Championship and a former Men’s Freestyle World Champion, he’s also fast, world-class fast. Kirby is one of only two American pilots ever to win the Red Bull Air Race World Championship, an international series in which pilots push the envelope by executing aerobatic maneuvers with absolute precision while racing against the clock. Like many of the show pilots, Mike’s passion for aviation started when he was very young. Mike’s Dad took him to his first air show at their hometown in Iowa at the age of 10. Thirty two years later, Mike has accumulated more than 24,000 flight hours and has qualified in more than 40 aircraft. Mike keeps a very busy schedule flying for Corporate America as well as keeping a full time air show schedule from April through November. Hank Bruckner was always captivated by aircraft and flying. He became a flight instructor shortly before retiring from the Air Force in 1990, and began instructing, eventually starting his own flight school—Kaimana Aviation—where he currently teaches aerobatics, unusual altitude recoveries, spins and tailwheel transition training. Clint’s flying career began 45 years ago while attending college at the University of Arizona. Upon graduating, Clint joined the Tucson Air National Guard. Two years later he completed USAF pilot training as a Distinguished Graduate. “Sensing the need to keep pulling some Gs,” as Clint puts it, he founded Acroflight, Inc. in 1996 and acquired an Extra 300L which he named Onipa’a (strong, steadfast). Clint has provided aerobatic rides to more than 500 customers and performed 24 air shows at various locations in Hawai’i. He has 4,200 flight hours, including 1,100 hours in the Extra. The son of a career Navy man, Alan Miller’s life-long passion for aviation began while growing up aboard Barbers Point Naval Air Station in Hawaiʻi. After two years of anticipation and preparation, Alan and his and crew are pleased to bring his uniquely “local style” two-part performance to Oahu for the very first time during the Kaneohe Bay Airshow in 2012. When most people turn 50, they figure it’s time to relax and settle into neutral while coasting toward retirement. Not Jacquie B! When Jacquie turned 50, she launched her solo aerobatic career with her one-of-a-kind Pitts Special biplane. Nearly ten years later, Jacquie B is still in this game, and her list of performance dates is growing. Moreover, Jacquie is a powerful inspiration to her two million fans who realize that they, too, can accomplish great things later in life. The U.S. Navy Parachute Team, “Leap Frogs” will be free falling out of an aircraft 12,500 feet from the ground. When free falling, jumpers reach speeds of 180 miles per hour as their body straightens, similar to luge racers. Be on the lookout for the following formations: downplanes, sideplanes, dragplanes, diamonds, big stacks, tri-by-sides, and T formations. The Flying Leathernecks are a group of skydivers who share the passion for jumping. Their 10,000-ft. jump will be a patriotic exhibit including a large American flag, smoke trailers and starburst effects. Check out the action as the fire-breathing Flash Fire Jet Truck hits the runway in competition with planes overhead. Will it be wings or wheels that finish first? This act is sure to be a crowd pleaser for all ages, mixing all the fun and entertaining elements of a family friendly circus with a combination of extreme speed and high intensity, fire breathing excitement! At ALL entry points to the air show flight line, ALL bags will be quickly inspected, and all individuals are subject to search prior to entering the air show flight line. Please note that large bags and/or backpacks, ice chests and coolers will not be permitted. Small bags, such as purses, fanny packs, and diaper bags (8 1/2 x 11) will be permitted. It is recommended that spectators minimize the number and size of permitted items to reduce the inspection time prior to access into the flight line area. There will be two entrance lines at each gate. One will be for people carrying bags, or other items to be inspected, and one for those with no inspection items. Like most people of his generation, my father saved stuff, especially “special” stamps, currency and coins – below is a $10 bill of his that he gave to me. According to the Federal Reserve, with the start of World War II, the US started printing specialized military currency to provide economic stability for the US dollar in occupied countries. In Hawaiʻi, the Treasury Department replaced all US currency with special issue notes as a precautionary measure in the event of a Japanese victory. These notes were circulated only in Hawai‘i and their brown seals and serial numbers differentiated them from notes issued on the mainland. 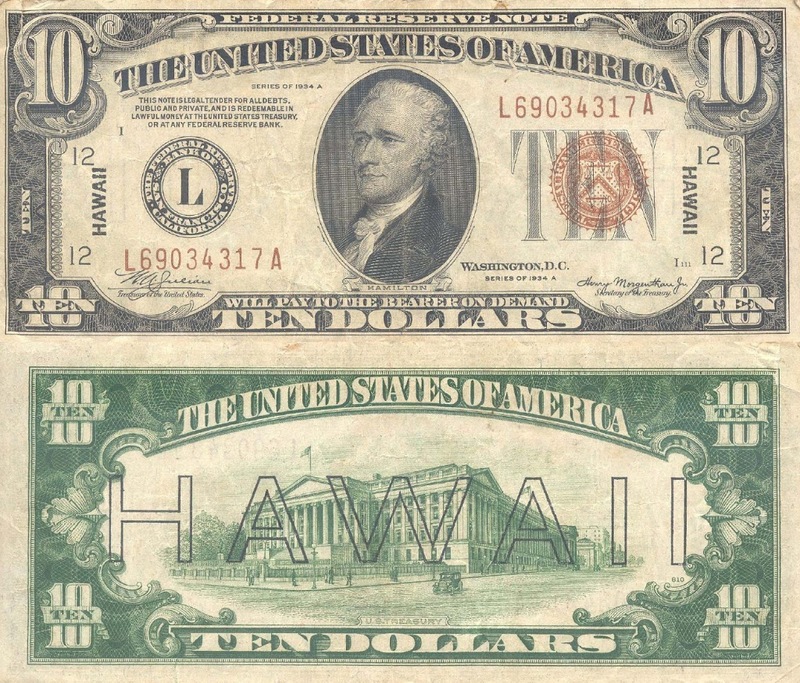 Overprints of the word HAWAII were made; two small overprints to the sides of the obverse of the bill between the border and both the treasury seal and Federal Reserve Bank of San Francisco seal, and huge outlined HAWAII lettering dominating the reverse. The hope was that, should there have been a Japanese invasion, the US Government could immediately declare any Hawai‘i-stamped notes worthless, due to their easy identification. Hawai‘i wasn’t the only place where special currency was distributed. Similarly, special notes were issued for use by American troops during the invasion of North Africa in November 1942. These notes were overprinted with distinctive yellow Treasury Seals to distinguish them from the regular Silver Certificates overprinted with blue seals. Like the overprinted Hawai‘i notes, these distinctive certificates could be declared worthless if large amounts fell into enemy hands. In addition to the Hawai‘i currency issued, the Bureau of Engraving and Printing produced or oversaw the private production of Allied military currency used in Italy, France, Austria, Germany and Japan during and after the war. The Department of the Treasury redeems all genuine United States currency at face value only, and does not render opinions concerning the numismatic value of old or rare currencies.